I have been in France a whole week! Hard to believe. In that time, we’ve managed to accomplish quite a bit, but we’ve also encountered some challenges…like a gas stove that isn’t properly regulated and is turning pots, pans, counter-tops and fingers black with soot. The oven won’t stay lit either. I imagine Stuart will fix all this when he has time (and can figure it out). In the meantime, I am being very careful not to place pots onto the counters after cooking something and am turning them upside-down until they can be scrubbed properly lest everything turn black. We also had a mystery with the hot water which Stuart thinks he has now solved. The first night, we ran out around 6PM or so. We thought the hot water heater was busted and made plans for alternative showering, but the next morning, we had plenty of hot water again. Apparently, we’re on some kind of timer or something which has now been reset (so I’m told). We’ve also had an upstairs bathroom sink leak through the floor to the dining area, fortunately caught early before damaging anything. Stuart says he can fix this too. Otherwise, the house is quite comfy and embracing. Of course, our 50 degree sunny weather hasn’t hurt the last couple of days to make everything feel that much sweeter. We knew we’d have lots to do and buy, so we’ve had to prioritize somewhat. Things related to food, sleep, and warmth come first: hence the fridge, bed, comforter, and fuel for the heater. Next comes the highly practical: power strips, trash bin, dustbuster, and things still to buy: hooks, bathmat, couch, lighting. Eventually, we’ll start working on aesthetics: mirrors, more furniture, new towels. Then we’ll need to work on getting the gallery in order. And finally, we’ll get that guest room set up (we might just have to rent it out to stay afloat!). Then we’ll move outside, pretty things up a bit in the yard, and plant a garden. We have two rooms downstairs that we will devote to a gallery/studio. The plan is for Stuart to display his paintings (and mine too as I paint them) and be open perhaps one day a week during tourist season and by appointment otherwise. We’ll also use these two rooms to hold events. Stuart wants to start teaching painting again, and I plan to offer meditation and voicework. We might also sponsor house concerts or other creative events just for fun or rent out the space for others to use, although with limited parking, these will have to be small events. We drove around town a few days ago and came across another gallery near the lake, so who knows? Maybe we can make friends and have some kind of art crawl during the summer. For me the biggest struggle and greatest triumph happened at the grocery store on day one. I was feeling quite overwhelmed with the mass of decisions we were having to make, so I decided to buy myself some tulips. (Stuart offered to buy them for me, but I needed them to be from me to me…ya know?). The woman at the check-out was excruciatingly rude and impatient with my complete ignorance and scant communication skills. I became more and more flustered and felt about as big as a flea, shrinking with each roll of her eyes. So, after the transaction was done and I made my escape, I returned to her and pulled out one of my tulips…”pour vous madame”. That sweet, floppy tulip was too much for her pinched-up face to endure and a smile encroached. She thanked me. I got the sense no one ever does anything kind for her and that she doesn’t yet know how to do such things for herself. I admit, her rudeness mixed with my exhaustion and anxiety had me fighting tears. Resolving my feelings in the moment and offering her that tulip took all of my strength. It was one of the hardest things I’ve ever done. Still, I broke down in the car immediately afterwards. It was a mixture of “Why are people so cruel?” and “How will I ever survive here?” but also of huge spiritual relief for turning the situation around for myself and who knows, maybe altering her life forever too with my gesture. 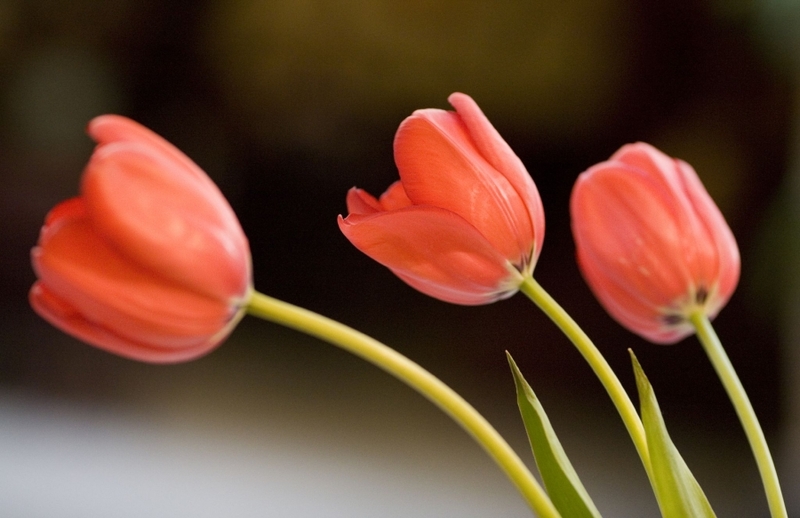 I thank Matt Khan for sharing his perspective so that I had such a choice available to me when normally, I would have carried the weight of her for hours, making her wrong and wholly unlovable and hating my tulips for the memory attached. We’re all just human and in desperate need of kindness from others. In fact, the more cruel our behavior, the more love we need. Finally this week, I have set up my meditation room and office where I meditate and do my kundalini yoga every morning. I still need a few things to make the room fully serviceable, but the essentials are here. It is my retreat, my quiet sanctuary, and I am so grateful for it because the rest of the house is still a mess (and I’m not very good with messes! ).